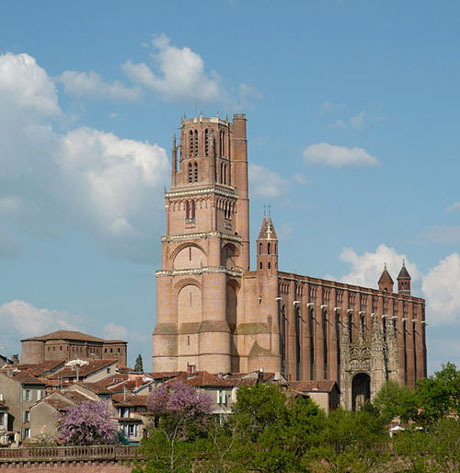 Albi is located on the River Tarn, in the Tarn département, Midi-Pyrénées region, 85 km northeast of Toulouse. 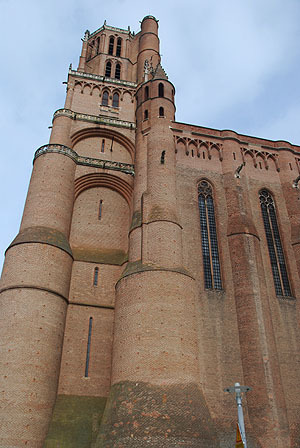 It was the seat of the Bishop (later Archbishop) of Albi and is the seat of the Diocese of Albi. 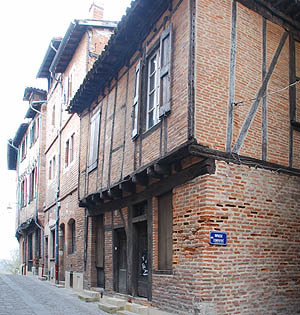 The episcopal cité around the cathedral (in the center of the modern city), was added to the UNESCO list of World Heritage Sites in 2010. 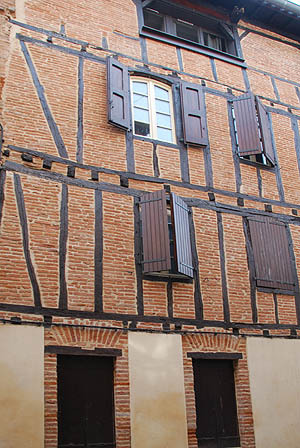 On the banks of the Tarn river in south-west France, the old city of Albi reflects the culmination of a medieval architectural and urban ensemble. 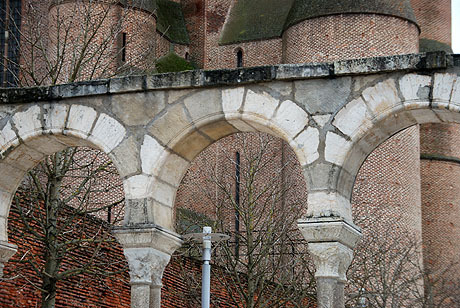 Today the Old Bridge (Pont-Vieux), the Saint-Salvi quarter and its church are testimony to its initial development (10th -11th centuries). 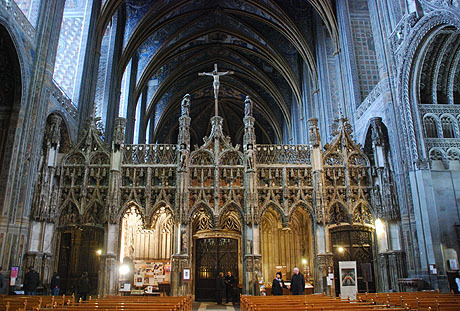 Following the Albigensian Crusade against the Cathar heretics (13th century) it became a powerful episcopal city. 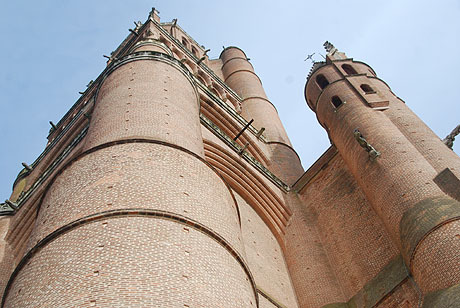 Built in a unique southern French Gothic style from local brick in characteristic red and orange colours, the lofty fortified Cathedral (late 13th century) dominates the city, demonstrating the power regained by the Roman Catholic clergy. 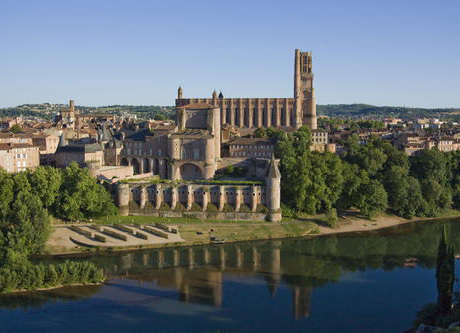 Alongside the Cathedral is the vast bishop�s Palais de la Berbie, overlooking the river and surrounded by residential quarters that date back to the Middle Ages. 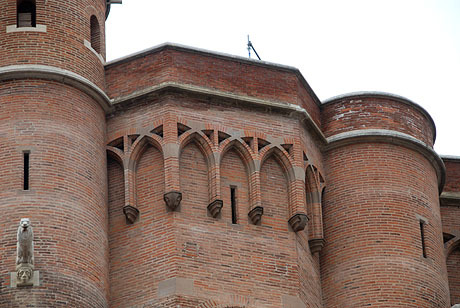 The Episcopal City of Albi forms a coherent and homogeneous ensemble of monuments and quarters that has remained largely unchanged over the centuries. 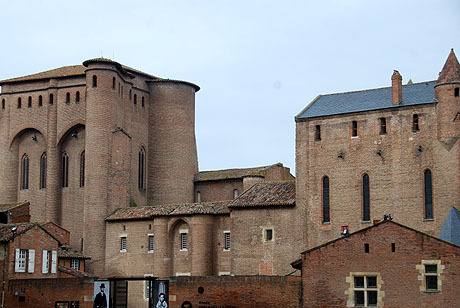 Like many historic major centres in the Languedoc, the original city of Albi was a castrum (castle within a walled town) sited on a hill, next to river at a point where the river was fordable. 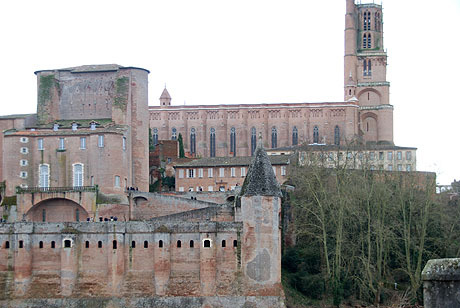 Today, Albi is located in the Tarn departement, within the Midi-Pyrénées region of souther France. 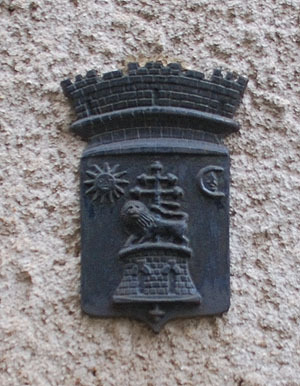 Its inhabitants are called Albigensians (French: Albigeois, Albigeoise(s), Occitan: albigés -esa(s)). 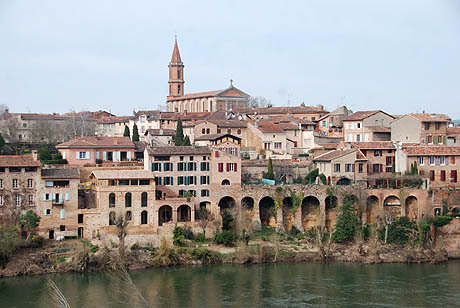 The first human settlement in Albi was in the Bronze Age (3000-600 BC). 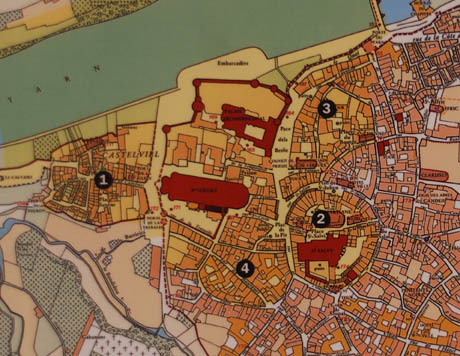 An Oppidum stood on the site (in the centre of the modern city of Albi). 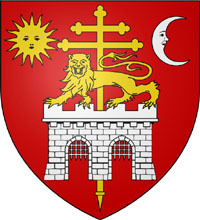 After the Roman conquest of Gaul in 51 BC, the town became Civitas Albigensium, the territory of the Albigeois, Albiga. 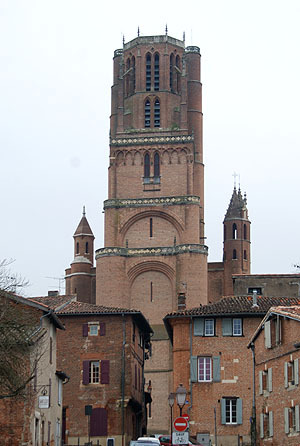 In the medieval period the ownership of the town was disputed by the Counts of Toulouse and the Trencavels, Viscounts of Albi, both of them later also in dispute with the ever increasing temporal claims of the Bishops of Albi. 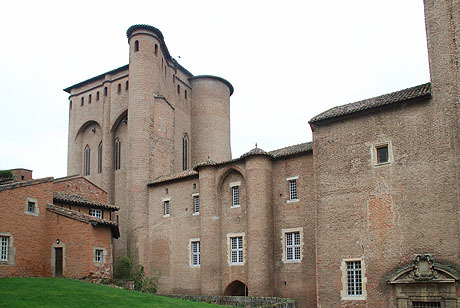 The first well-known member of the Trencavel family was Ato I, viscount of Albi in the early 10th century. 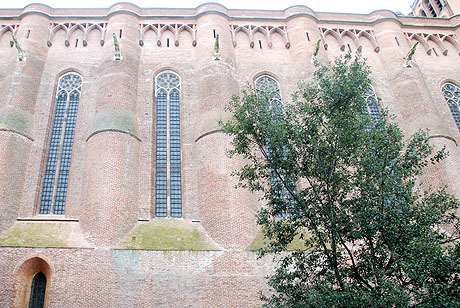 He was followed by five generations of viscounts of Albi in direct father-to-son descent. 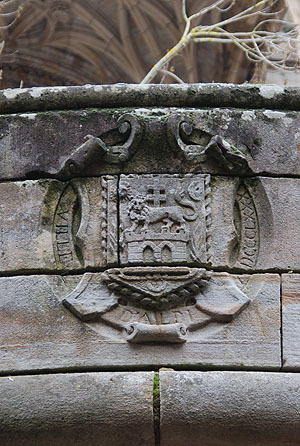 During this period the family came to dominate the local bishoprics, a normal arrangement for the period. 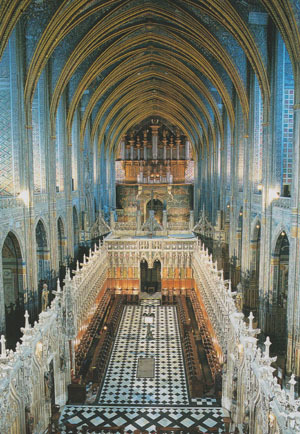 Each of the viscounts from Ato II had a younger brother named Frotarius (or Frothaire) who was a bishop, of Albi, Cahors, or Nîmes. 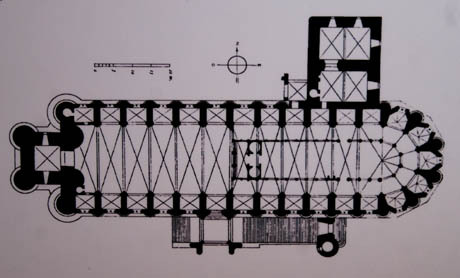 In 1040, Albi expanded and the Pont Vieux (Old Bridge) was constructed. 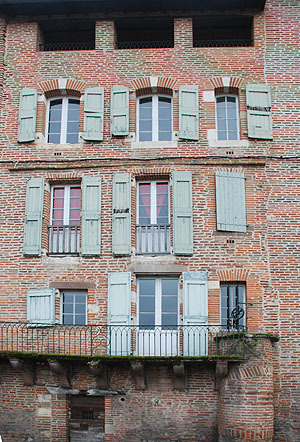 New quarters were built, indicative of considerable urban growth. 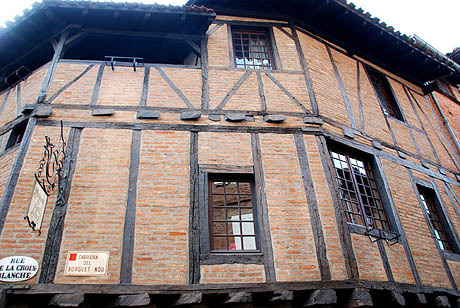 The city grew rich at this time, thanks to trade. 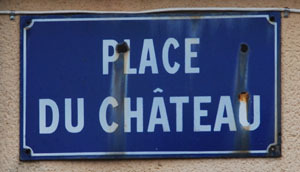 and to tolls charged to travelers for using the Pont Vieux. 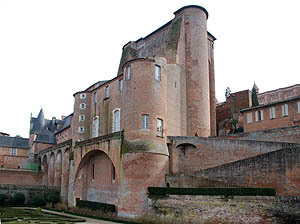 The three way tussle between the Counts of Toulouse, the Viscounts of Albi, and the bishop of Albi was resolved during the Cathar Wars. 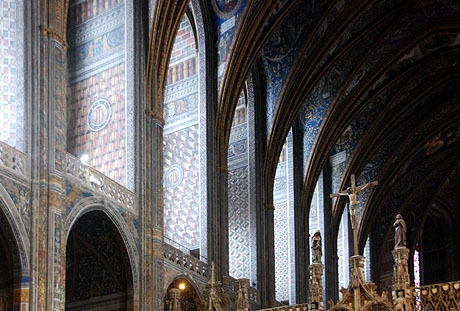 The Crusaders disspossed both the Counts and the Viscounts, leaving the Bishops of Albi, their natural ally to fill the power vacuum and take over all temporal responsibilities for Albi. 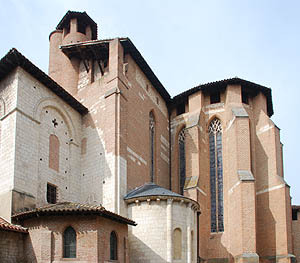 After the end of the conflict the then Bishops of Albi, Bernard de Castanet started a major building programme. 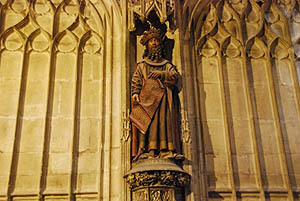 Widely hated he had the dual objective of protecting himself from his own flock and impressing the power of his Church. 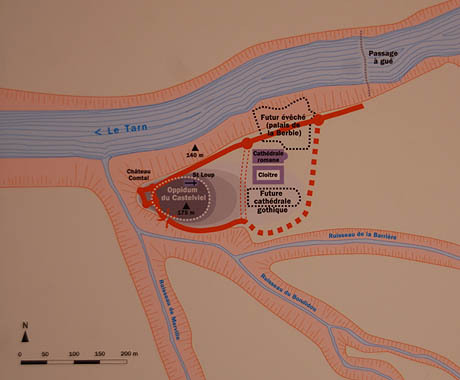 He therefore built himself a new walled city, La Cité Episcopale - The Episcopal City. 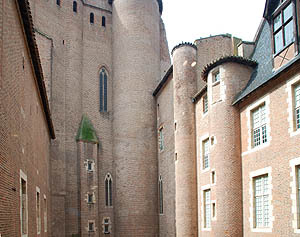 Within its walls were the Cathedrale Sainte Cécile - Cathedral of Saint Cecilia and a castle which evolved into the The Palais de la Berbie - The Bishop's Palace. 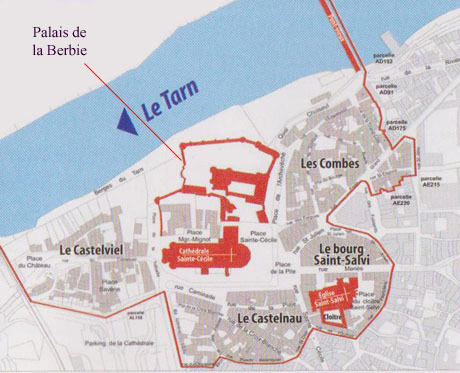 In later times the city grew further and another set of walls were built encompassing Castelviel - The Old Castle, Castelnau - The New Castle, ,the Bourg of Saint-Salvi, further bourgs, and The Episcopal City. 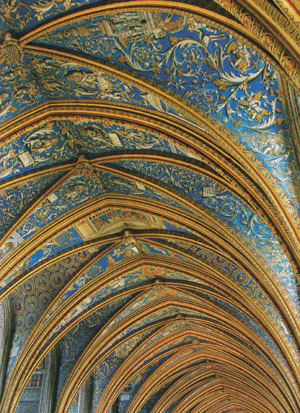 The pastel trade brought great wealth during the Later History of Albi , to which numerous surviving grand buildings still bear witness. 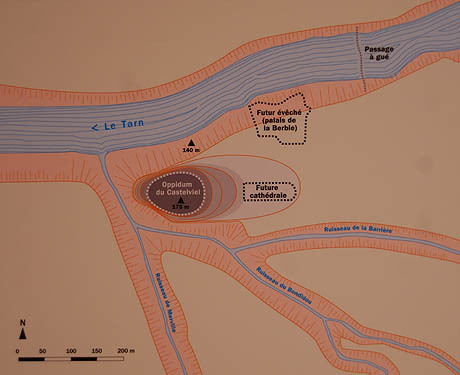 The original Oppidum lay on a high spur defended by the Tarn and iits tributaries - a classic site similar to that of many Languedoc cities.. 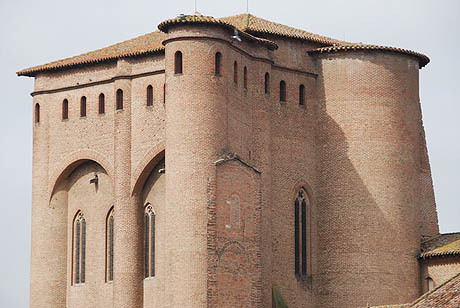 The original medieval castrum lay on the site of an ancient Oppidum, in the area still known as Castelviel (Occitan for Old Castle) and would probably have included what much mater became the Bishops city. 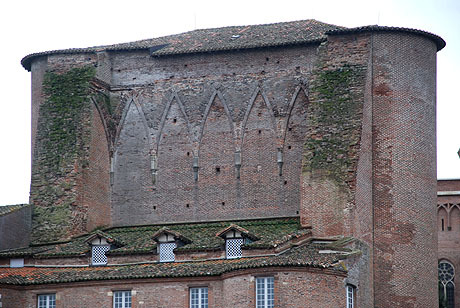 The original castrum of Albi comprised, like all castra, a castle insiide a walled city. 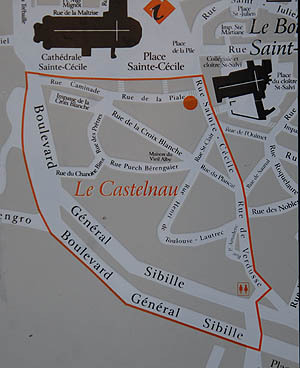 As the Castelviel declined in importance a new castle was built on an adjacent site known as Castelnau (Occitan for New Castle). 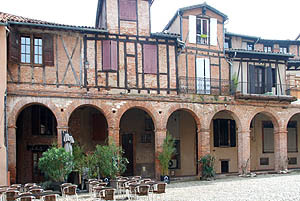 Castelnau grew up during the XII and XIII cenuries. 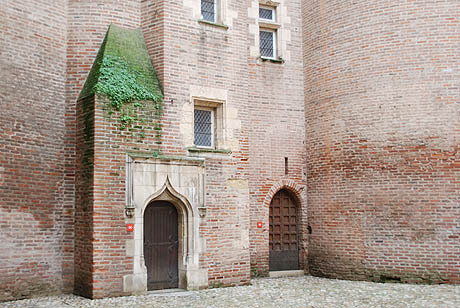 A fauxburg developed into the Bourg Saint-Salvi, build around the church of Saint-Salvi, named after the first Bishop of Albi (574-584). 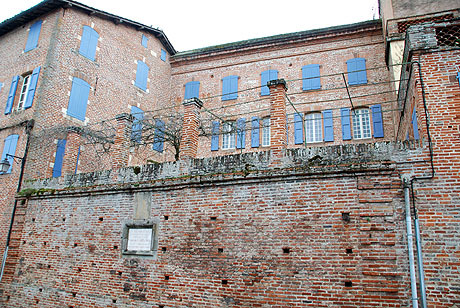 It grew up in the XI and XII century, but the houses now standing here date from the XVI, XVII and XVIII centuries. 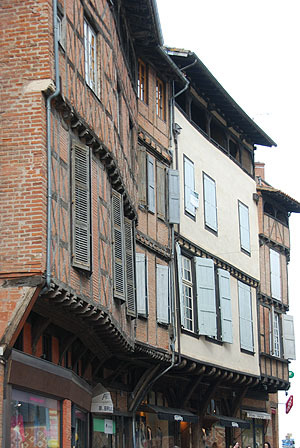 This bourg would originally have had its own defensive walls, outside the medieval cité. 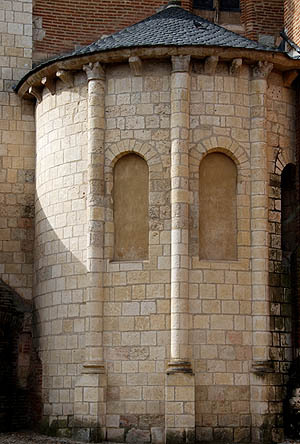 In 1208, the Pope and the French king joined forces to combat the Cathars,. 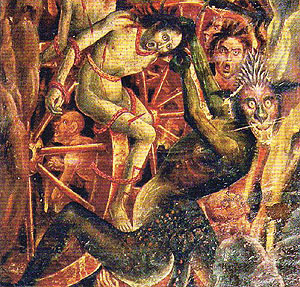 Repression was severe. 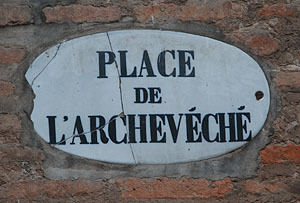 The area, until then virtually independent, was reduced to such a condition that it was subsequently annexed by the French Crown. 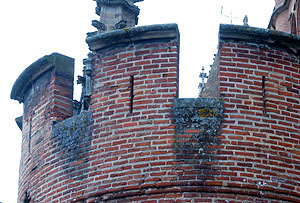 After the Cathar Crusade the two feudal lords of Albi (The Count of Toulouse and the Viscount of Albi, Carcassonne, Béziers and the Razés) were dispossed and the only remainiing potentate, the Bishop of Albi, effectively took over, building himself a new cité with a new bishop's castle and a new cathedral. 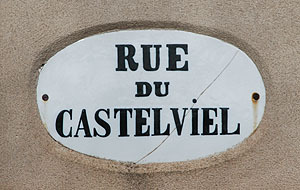 Castelviel, still a separate walled cité, was taken over by Simon de Montfort who gave it to his brother Guy de Montford, Seigneur de Castres. 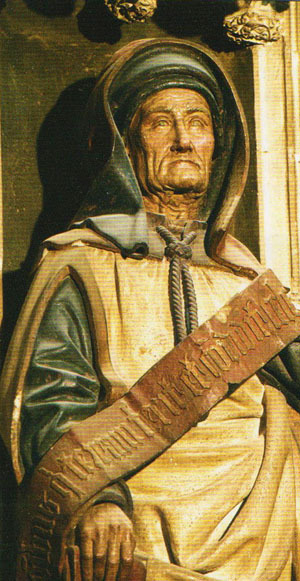 Dominic Guzman founded the Dominican Order in the Languedoc to combat the Cathars. 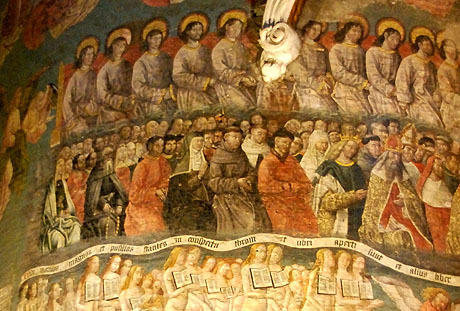 He became Saint Dominic and his Dominicans founded and operated the first medieval Inquisition. 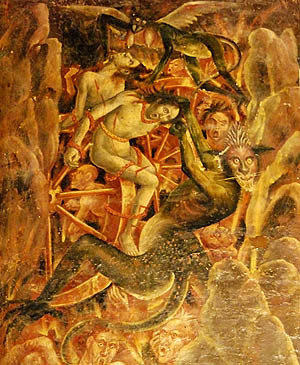 He is represented here in the Basilica of Saint Cécile, Albi, recognisable by his Domincan winter garb, his halo with a star, and his dog with a burning torch in its mouth. 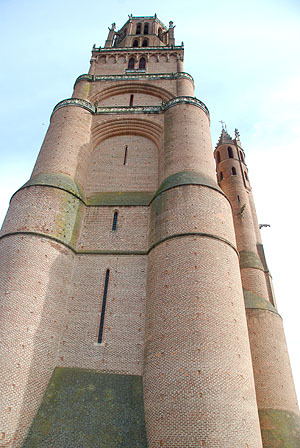 Bernard de Castanet (c. 1240 - 14 August 1317) was the bishop and cardinal of the Roman Catholic Church. 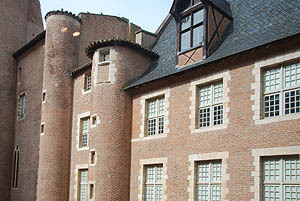 He was born in Montpellier and obtained a law degree from the University there. 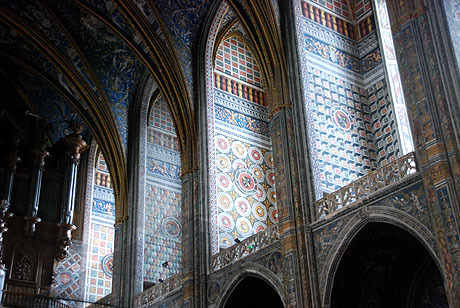 He conducted diplomacy for the Church in Italy and Germany. 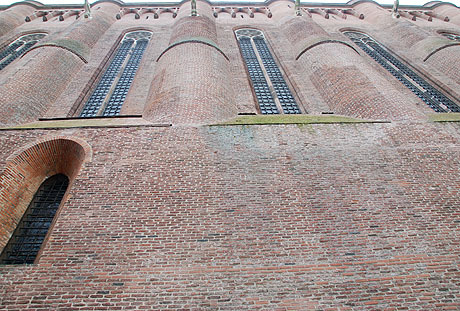 Castanet was appointed the Bishop of Albi in 1276. 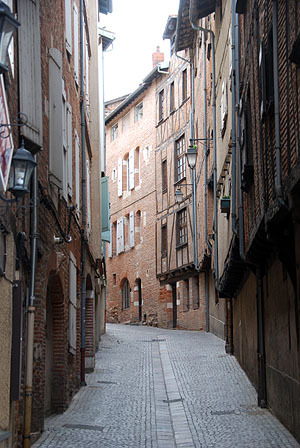 In this post, Castenet engaged in a power struggle with feudal lords of the place. 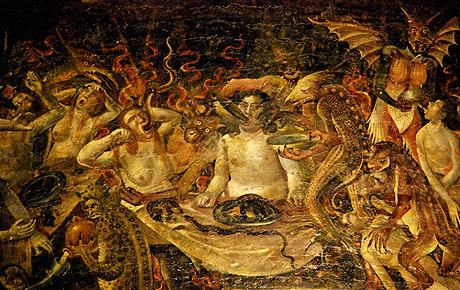 He used accusations of heresy and the inquisition to control and punish those who opposed him. 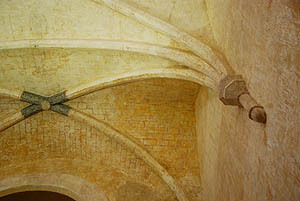 Castenet was Inquisitor of Languedoc and Vice-Inquisitor of France. 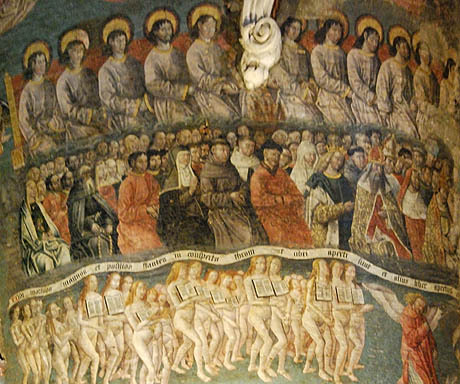 He was not a Dominican (as most inquisitors were), though he had a good relationship with the Dominicans. 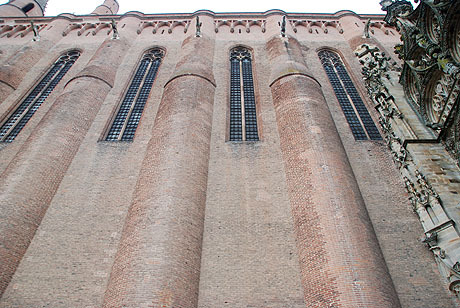 In 1287 Castanet ordered the start of construction on a new bishop's palace at Albi along with his adjacent cathedral. 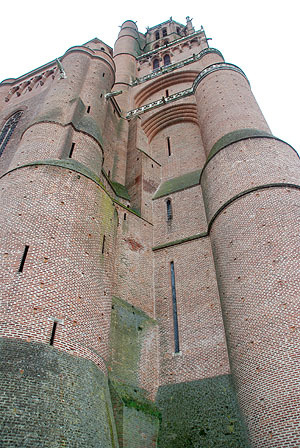 The palace was a defensible chateau-fort, and the cathedral resembled one with massive southern-Gothic buttress and huge solid walls with only high windows. 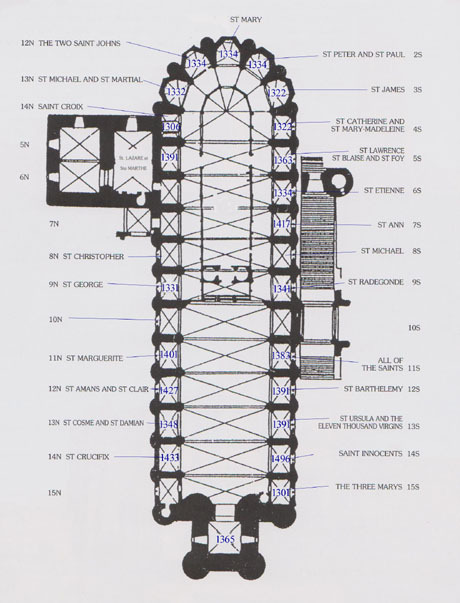 The whole complex was surrounded by a defensive wall, partly because he was so unpopular among his flock, and partly because he was so unpopular with the king of France. 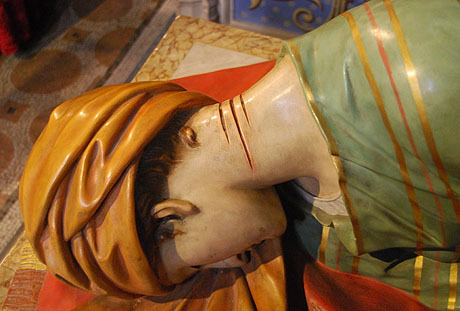 In 1307, he was accused of murder, pastoral neglect, simony, cruelty in the exercise of justice. 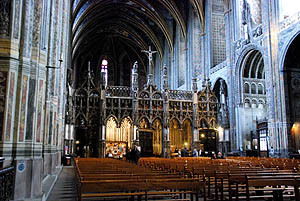 As in similar cases no sentence was passed, but he was transferred to another diocese (in his case to become the Bishop of Le Puy-en-Velay in 1308). 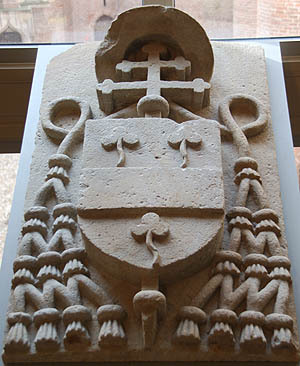 A few years later, on 17 December 1316, Pope John XXII, an old friend, appointed Castanet a cardinal and he joined the papal curia. 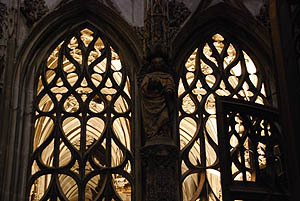 In Avignon, Castenet wrote the initial indictment of Bernard Délicieux, the only churchman to openly complain about the corrupt practices of Dominican inquisitors. 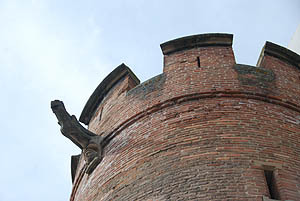 De gueules, au château crénelé de quatre pièces d'argent, maçonné de sable, ouvert du champ de deux portes coulissées d'argent, sommé d'un léopard d'or les pattes posées sur les quatre créneaux, le tout brochant sur une croix archiépiscopale d'or posée en pal, adextrée en chef d'un soleil du même et senestrée d'une lune en décours d'argent. 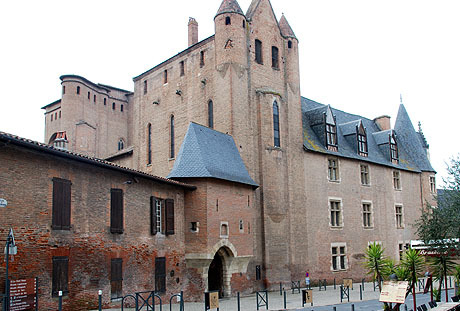 La Cité Episcopale was a later walled cité, built to defend the unpopular Bishop of Albi, incorporating both the Sainte Cécile Cathedral and the The Palais de la Berbie - The Bishop's Palace. 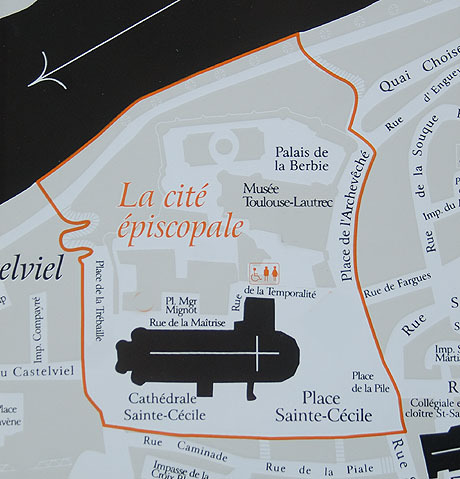 La Cité Episcopale incorporating both the Sainte Cécile Cathedral and the The Palais de la Berbie - The Bishop's Palace. 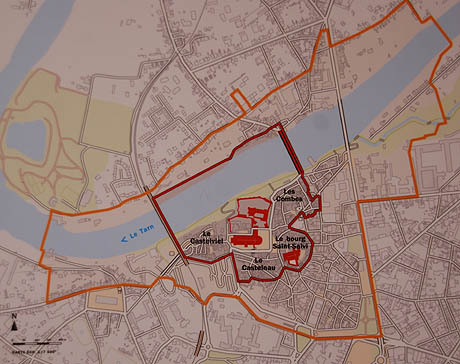 The orange line shows the location of the bishop's city wall. 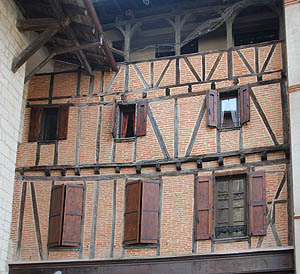 From the XV century the cités losts its defensive features and became more of a luxury palace furnished with large Renaissance windows. 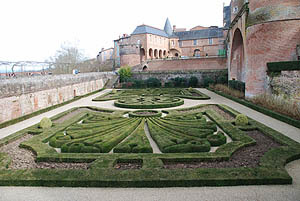 The parade ground was turned into a fashionable classical garden and most, but not all, of the city wall was demolished. 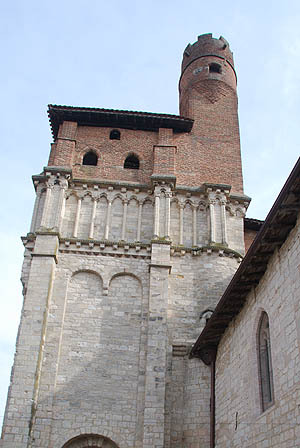 Among the buildings of the town is the Sainte Cécile cathedral, a masterpiece of the Southern Gothic style, built between the 13th and 15th centuries, a basilica as well as a cathedral. 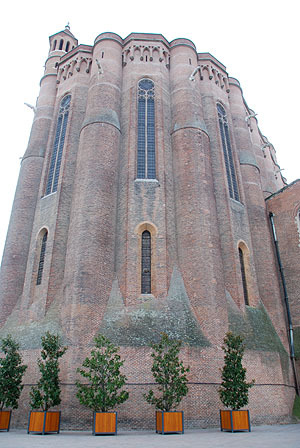 It is notable for the strong contrast between its austere, defensive exterior and its sumptuous interior. 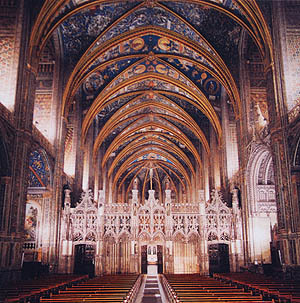 As the official guidbook says "Aware of his responsibilities as bishop, lord of the city and vice-inquisitor of France, he intended the cathedral to proclaim the supreme grandeur of God, the solidarity of Christian faith and the rifidity of orthodox belief in the face of Catharism (or the heretic Albigensians) which was not entirely eradicated.". 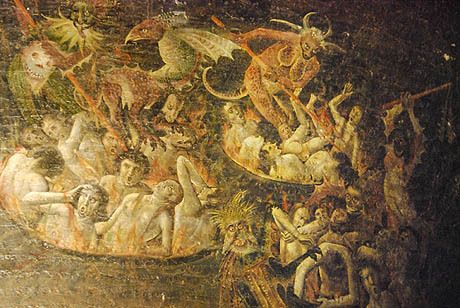 As in all other Catholic churches there is no hint of regret for the burning alive of people whose only crime was to disagree with Catholic theology, nor any mention that the bishop's new complex had to be defensible because the bishop himself was so unpopular. 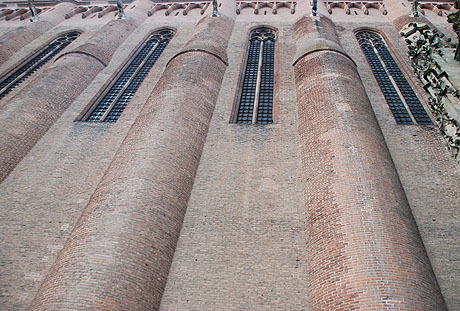 The exterior reflects the need for austerity and statement of absolute power reflects not only the need to project power, but also an attempt to match the simpicity and austerity of the Cathars. 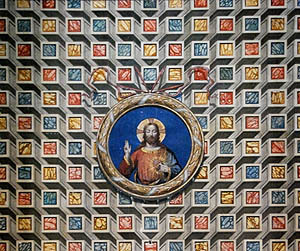 The interior by contrast is later and reflects the otherwise universal Catholic preference for opulence, colour, finery and expensive accoutrements. 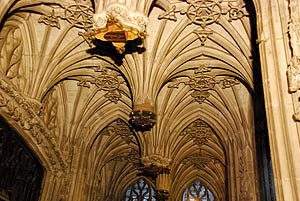 the military aspect of the cathedral. 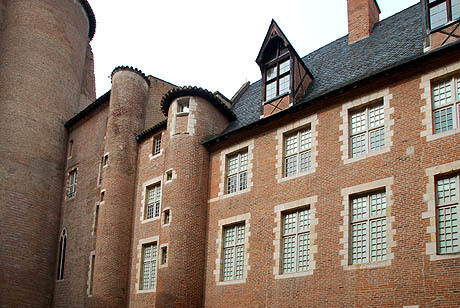 Most notable are the sheer walls, false machicolations, crenalatons, chemin du ronde, gun ports and high windows (the lower windows were added at the end of the fifteenth century). 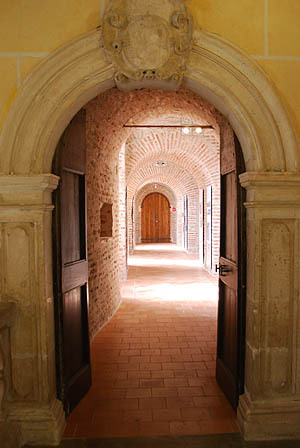 the Dominique de Florence Doorway. 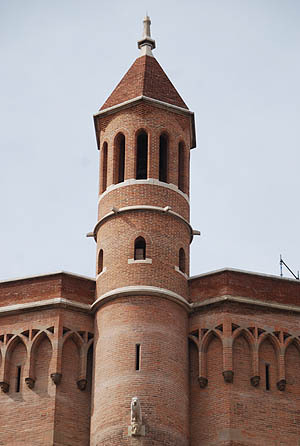 the 78 m high bell tower. 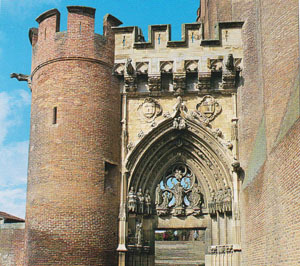 the Baldaquin over the entrance (15151540). 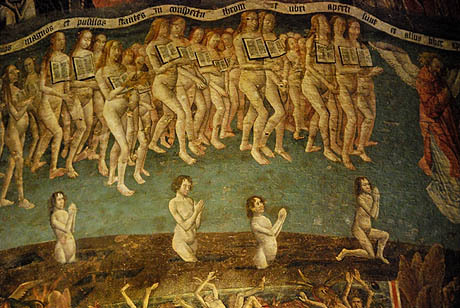 The doom or "last judgement". 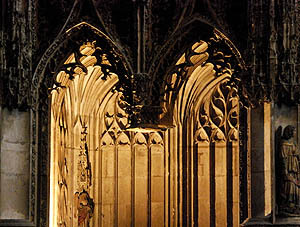 Normally the doom was painted on the rood screen, but Albi is unusual in that the chancel and its rood screen are later additions. 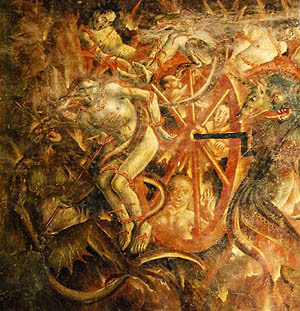 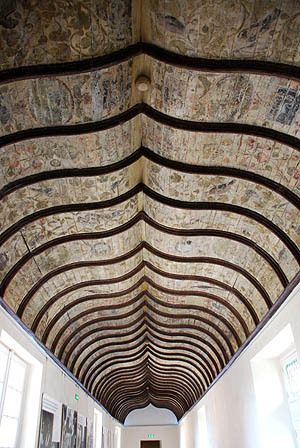 The doom was therefore painted on the west wall, at the "wrong end" of the nave. 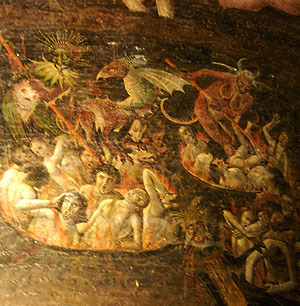 It is supposed to have been the larges doom in the world at 18x10 meters. 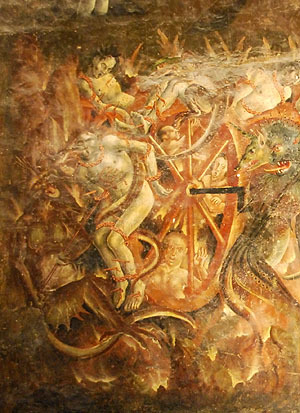 The Last Judgement itself has disappeared (vandalised by the Church authorities in the XVII century) so God and Saint Michael are missing. 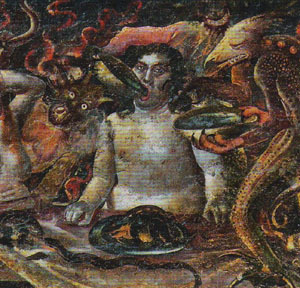 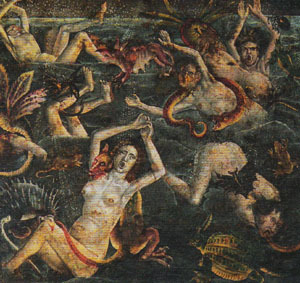 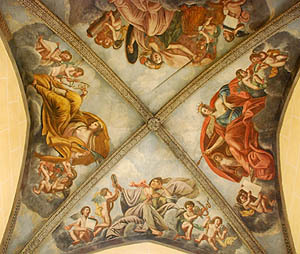 Along the bottom are imagined punishments in hell for the seven deadly sins: from left to right: pride, envy, wrath (half missing), sloth (missing), greed (half missing), gluttony and lust. 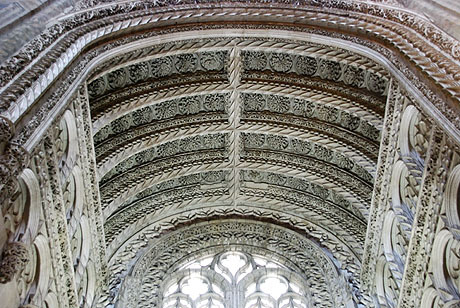 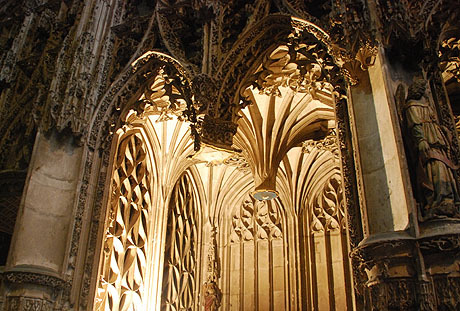 The rood screen is a filigree work in stone in the Flamboyant Gothic style. 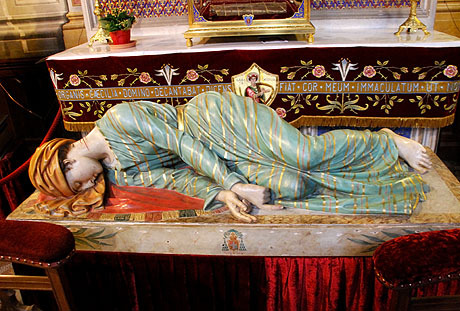 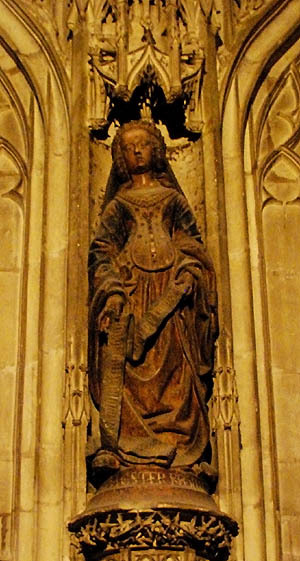 It is decorated with a magnificent group of polychrome statuary carved by artists from the Burgundian workshops of Cluny. 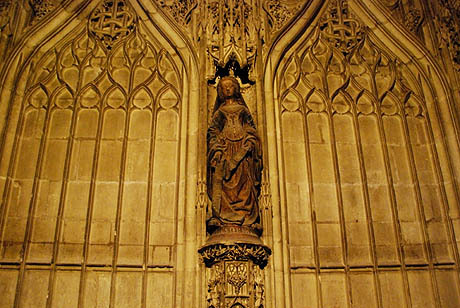 It features over 200 statues, which have retained their original colours. 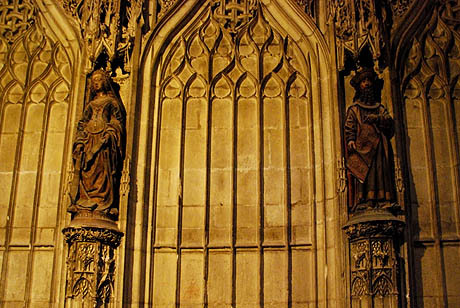 Statues of apostles (inside the choir) and prophets (outside the choir in the ambulatory), which are particularly well carved. 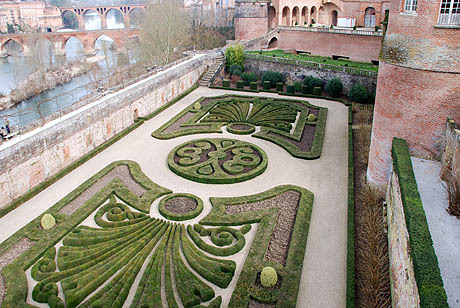 The Palais de la Berbie, the Bishops' Palace of Albi, is one of the oldest and best-preserved castles in France, predating the Palais des Papes in Avignon. 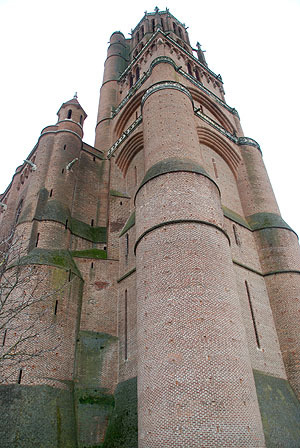 This fortress was completed at the end of the 13th century. 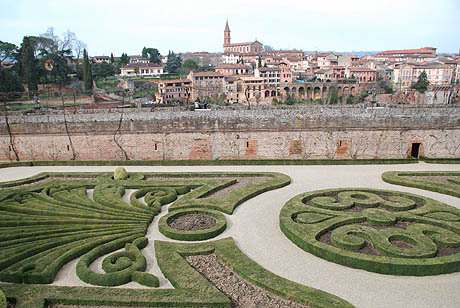 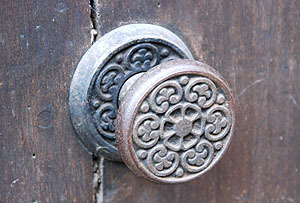 Its name comes from the Occitan word Bisbia, meaning Bishops' Palace. 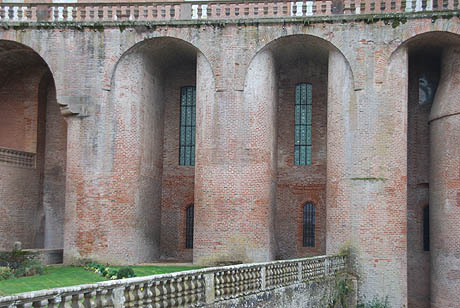 The fortress was extended up until the sixteenth century, after which most of the defensive features were removed, although you can still see impressive towers, gun ports and slots for port cullises. 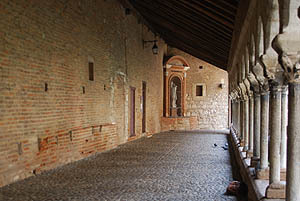 The palace can be seen from the outside, but most of the interior (including the windows) is hidden by modern panels - an absolute scandal for a world heritage site. 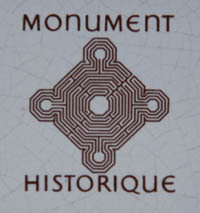 There is minimal information about the architecture or the history of the building, since all resources go into its role as a museum. 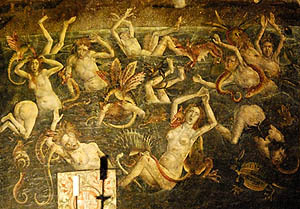 Why the philistine city autorities do not house their museum in a large Victorian building instead of a unique world Heritage fortress palace is anyone's guess. 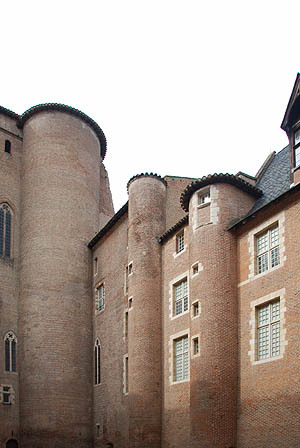 The palace is home to the Toulouse-Lautrec Museum. 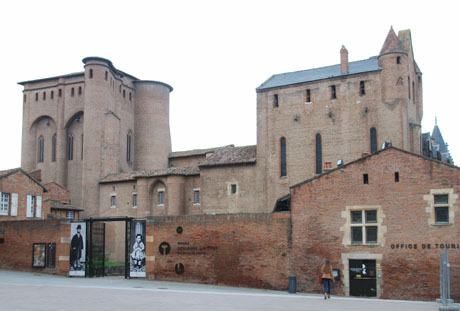 More than 1000 works, including the 31 posters, are held here. 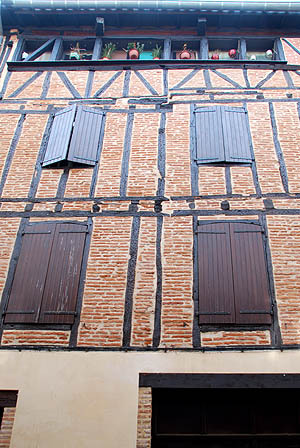 This body of work forms the largest public collection in the world devoted to Toulouse-Lautrec. 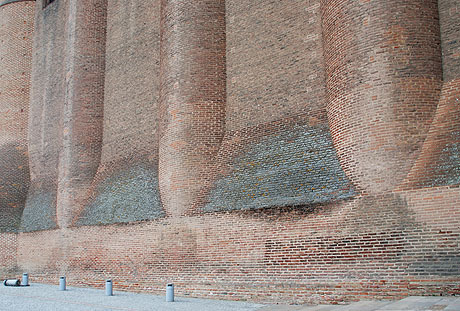 Very nice, but obviously in the wrong place. 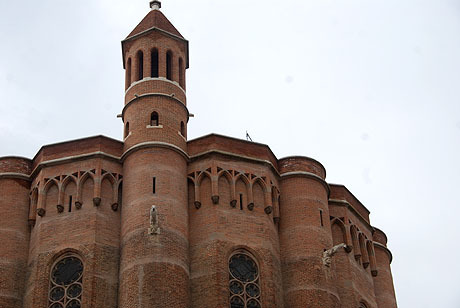 Albi was built around the original cathedral and episcopal group of buildings. 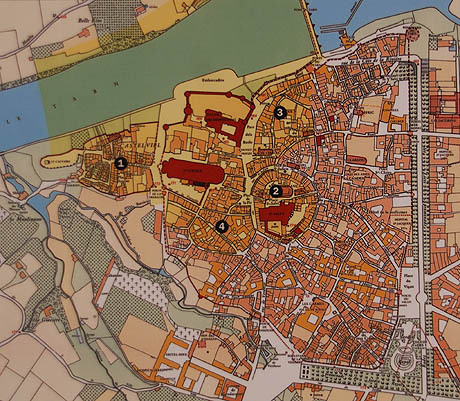 This historic area covers 63 hectares. 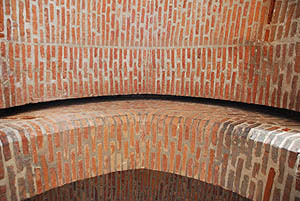 Red brick and tiles are the main feature of most of the edifices. 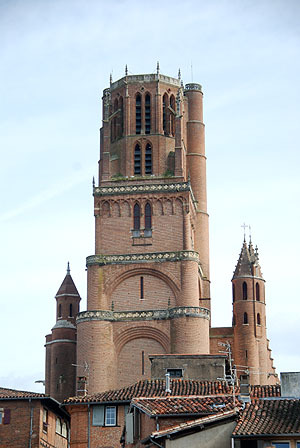 Among the buildings of the town is the Sainte Cécile cathedral, a masterpiece of the Southern Gothic style, built between the 13th and 15th centuries. 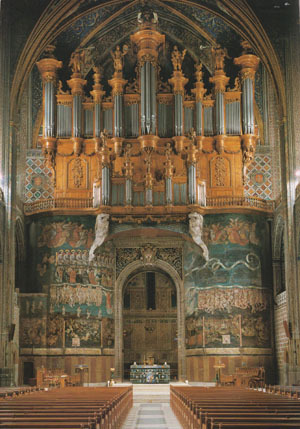 It is characterised by a strong contrast between its austere, defensive exterior and its sumptuous interior decoration. 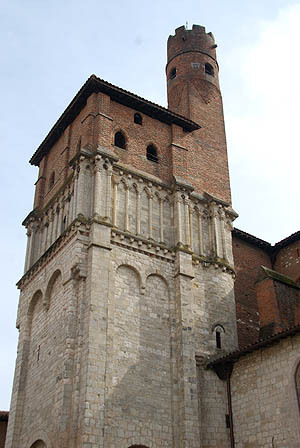 Built as a statement of the Christian faith after the upheavals of the Cathar heresy, this gigantic brick structure was embellished over the centuries: the Dominique de Florence Doorway, the 78 m high bell tower, the Baldaquin over the entrance (15151540). 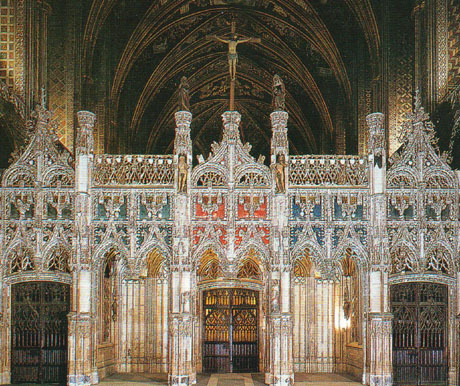 The rood screen is a filigree work in stone in the Flamboyant Gothic style. 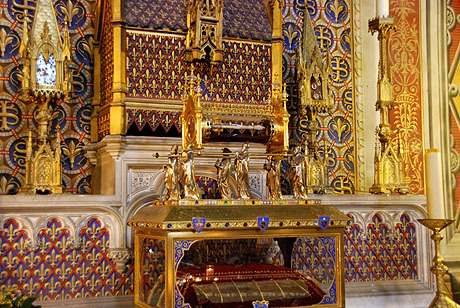 It is decorated with a magnificent group of polychrome statuary carved by artists from the Burgundian workshops of Cluny and comprising over 200 statues, which have retained their original colours. 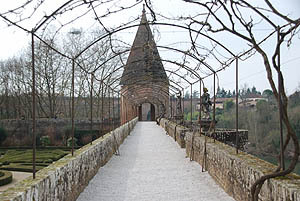 The Old Bridge (Pont Vieux) is still in use after almost a millennium. 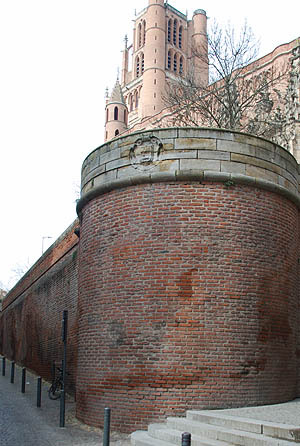 Originally built in stone (in 1035), then clad with brick, In the 14th century, it was fortified and reinforced with a drawbridge, and houses were built on the piers. 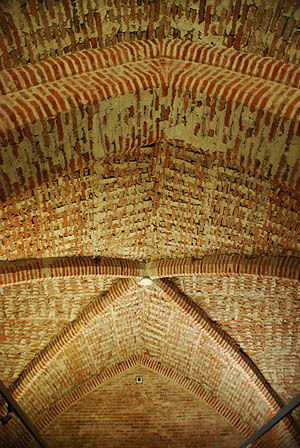 it rests on eight arches and is 151 m long. 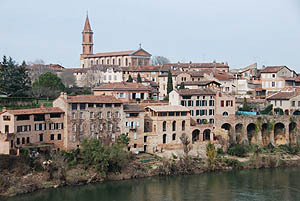 UNESCO's World Heritage Centre notes the Old Bridge (Pont-Vieux), the Saint-Salvi quarter, the quarter's church, the fortified cathedral (late 13th century) in unique southern French Gothic style from local brick, the bishops Palais de la Berbie, and residential quarters, which help the Episcopal City of Albi form a "coherent and homogeneous ensemble of monuments and quarters that has remained largely unchanged over the centuries... a complete built ensemble representative of a type of urban development in Europe from the Middle Ages to the present day."